Some rattle can spray lacquer might work well, easier than trying to wipe or brush something onto every weird part of the logs. I’d be a little worried about wood movement on that table top… it might crack and split later on in the current configuration, though this would add to the rustic look. Thanks for the reply. Since I’m so new to wood working can you explain ” wood configuration ” ??? Very interesting build, I like it. What Allen is saying is that the grain direction on your mitered frame runs perpendicular to the grain of the top. since wood moves across its width with moisture changes significantly more than its length, these parts will fight each other. eventually either your miters will open up or the top might get some splits. For finish, I agree spraying would be easiest way to cover the irregularities. Lacquer or polyurethane would work well. Polyurethane and Varathane tend to turn wood a yellow finish. The more coats the yellower it will go. I use product from MINWAX called Polycrylic SATIN finish. Your wood will retain its original color. After time this product will harden to almost plastic finish. I have had good results using Helmsman spar urethane in the rattle cans. Read instructions, follow instructions, enjoy your table. You can find it at Home Depot for about 10 bucks a can. Looks like you would probably need about 2 cans. You will also want to get some 220 grit, 320 and 400 grit sandpaper with a sanding block for sanding between coats (covered in the instructions on the can). Dont just use your hand, get the block; it will show you where your hi/lo spots are. Once you’ve found the low spots, that’s wjere you can use the sandpaper without the block. Oh, and get a bit of tack cloth – also in the paint aisle at depot – so that when you sand, you can remove all the white dust you’ll generate. Wow… Thanks for all the great input!!! I’m not feeling so intimidated to finish it now. This looks like a great place to hang out and learn. And thank you for the compliments as well… I just enjoying working with the wood. Kind of addicting!! To clarify, Minwax, Varithane and any other linseed oil based finishes will give the wood an amber look. I like it, but that may be because I grew up with Chevy’s/Fords (polymerized linseed oil and resin mix), but would be partial to Hondas or Subarus (waterborne) if that is what I was most familiar with. It’s said the polymerized oils hold up to abuse better, but that may not be an issue for you, in this application. Whatever you do, seal all twenty-seven sides (or six, or whatever) to minimize how fast the wood loses or gains moisture. If the wood was assembled at, say, a fifteen percent moisture content, then moved into a room with a dehumidifier (e.g., fireplace or stove), it’s going to dry and shrink, so it’ll move in strange ways. All that aside, nice job. I like it too. 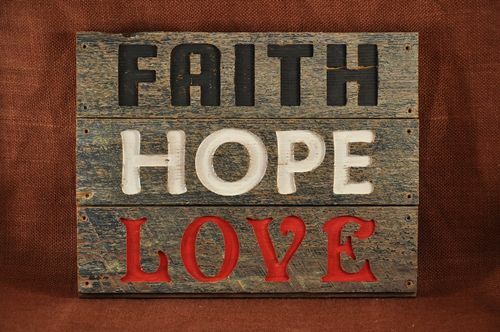 I make carved signs and plaques out of barn wood, which reminds me a lot of your table. The wood has been out in the weather for a hundred years and has taken on a lot of dirt, bug residue, etc. I don’t want to lose the barn wood appearance but I need to seal the material before it is hung on someone’s wall. I use rattle can spray lacquer made by Minwax and sold at Walmart, Home Depot and similar places. I would not brush it on if I wanted to keep as much of the original appearance as possible. If the coat is light, it doesn’t alter the color much. I think it is an enhancement of the appearance. You can keep applying light coats until you are satisfied with the appearance. I have used the Polycrylic material that someone else recommended and I think it looks like the surface is plastic coated. Different opinions from different people. If I were you, I would buy cans of all the suggested material and try them on scrap. That table is way too beautiful and unique for you to be unhappy with the finish. This is how the lacquered material on the barn wood looks.